Are you looking for a perfect present for special children in your life? Help is on its way! 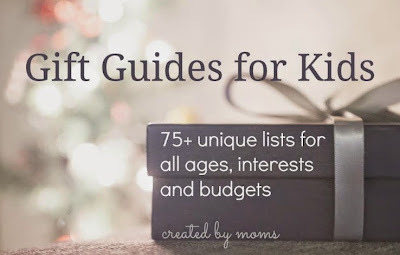 Bloggers of Kid Blogger Network combined efforts to bring you 75+ Gift Guides for Kids covering all ages and all interests. I am joining in with my suggestions of Single Player Brain Games for kids. What’s So Special About Single Player Games? Readers who follow my blog know all too well that I have an only child. Single player games have obvious advantages for single children as they don’t require a partner. But it doesn’t mean that families with several children don’t need this kind of games. For once, most of the games still allow some sort of competition with players taking turns or timing their actions. Secondly, brain games offer a great opportunity for children to calm down and spend time on their own. 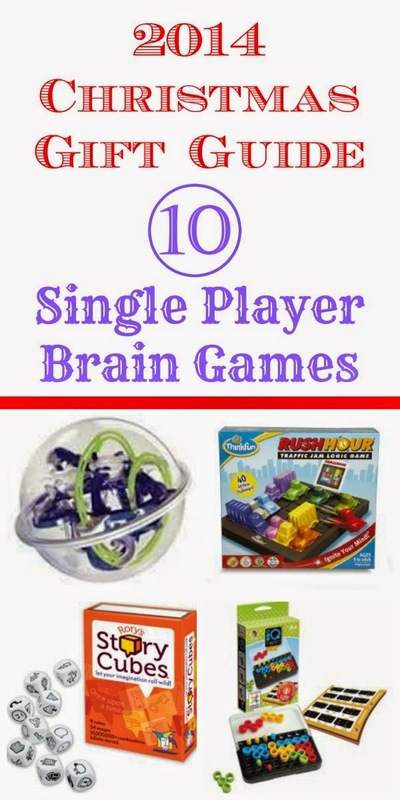 Almost all single player games are designed to challenge players in their logic skills, spatial reasoning or vocabulary without the need for flash cards or worksheets. They can be a great break in homeschool routine. In fact, if I were homeschooling, I’d make single player games a “required” part of my curriculum. Since my daughter is an only child and perceived as very intelligent by all the adults and most of her friends, she keeps getting “brain games” at every gift giving opportunity. This is why over her 8 years of life we have accumulated a sizeable collection of these games, plus various brain teasers and puzzlers, such as tangram sets, etc. I will try to give an honest assessment of our game collection, so you can see which game might be a good fit for your child. Name and Link – IQ Twist. It was a birthday gift for Smarty's 7th birthday. Pros: Simple game mechanics, but requires a lot of spatial reasoning. Entertaining both for kids and adults. The challenges take about 5-10 minutes. Small box, so the game is very portable. Doesn’t require reading once the concept is understood. Cons: You can only play it with multiple people through timed competition. Useless if even one part is lost (we still have them all). Useless if the challenge list is lost. How often daughter plays it. Not very often, I play it more than she does when I need to relax. Name and link – Solitaire Chess. Also a gift for 7th birthday. Pros: Good quality, tight packing, teaches chess concepts for those unfamiliar with it and strengthens spatial reasoning. Cons: Daughter could already play chess when we got a game. She found it boring in comparison to iPad single player chess games. Played it only once or twice. Name and Link – Rush Hour. This is the only game on the list that we own not as a physical version, but as an iPod/iPad version. We got it for ourselves when daughter was about 4. Pros: Very engaging, requires a lot of logical thinking and spatial reasoning. Doesn’t require reading. Cons: Higher level challenges can be frustrating. Only allows timed challenges between multiple players. How often daughter plays it: She plays it quite a bit, usually waiting for food in the restaurants or during travel times. This portability is a great advantage of iPod version of the game and this is why we didn’t choose a physical version. Name and link – Scrabble Flash. Received as a 6th birthday gift. Pros: Has single player and multi-player mode. Good training for real Scrabble. Strengthens vocabulary. Cons: Received the game too early. It’s better for ages 8+ when spelling is better established. In the beginning daughter took too long rearranging tiles. How often daughter plays it: I noticed her playing it quite often lately building more complex words. Name and link –Mighty Mind. We received it when daughter was about 4. Pros: Doesn’t require reading, appropriate for younger kids. Very colorful and packs in a relatively small box. Children can build from suggestions or experiment with their own designs. Cons: Pieces can get easily lost. Doesn’t scale well with age. How often daughter plays it: She played every challenge a few times between ages 4 and 6. Doesn’t play it now when she is older. Name and link – Rory Story Cubes. We received it as a present when daughter was about 6. Pros: Can be used as a multi-player game (more common) or as a single player game (this is how my daughter uses it). It jump starts imagination and is great for creative storytelling. Cons: The icons are sometimes confusing as to what they mean. As far as I recall, there is no explanation in the instructions that come with the game. How often daughter plays it: Occasionally she uses it to make up oral or written stories. More so during vacation times than during a school year. Name and Link – Logic Links. The only game on the list that we bought on our own as a Christmas 2012 present. 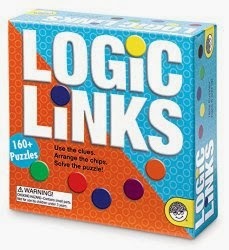 Pros: Simple to play (if you know how to read), short rounds, a lot of progressively more difficult logic challenges. Cons: Requires fluent reading and very detailed reading comprehension. Pieces can get easily lost. Relatively big box makes it not very portable. How often daughter plays it: Only if I play it with her (she takes a challenge and I take a more difficult challenge, then we compete). She often uses pieces as props in small world play. Name and Link – Discovery Kids Maze Ball. Received it as a gift for her 8th birthday. Pros: Strengthens coordination and calms mind while a player tries to get the ball travel through the maze. Cons: Pretty big and not portable. According to reviews, it can break if accidentally dropped. How often daughter plays it: Every day since her birthday. It was her favorite present (after books). Name and Link – Gravity Maze. Also a gift for Smarty’s 8th birthday. Pros: A marble run and a logic puzzle in one, high quality. Cons: Tricky game mechanics – a real mind bender. A lot of pieces to lose if you don’t put them away right away. How often daughter plays it: She just started exploring it. Name and Link – Laser Maze. Yet another gift for her 8th birthday. Pros: We have an older game called Lunar Lockout. It has a very similar idea for what needs to be done in the game but not as high-tech. As any child, Smarty is thrilled about high-tech component. Also, this is a great way to understand how light reflects of surfaces and how splitter mirrors work. Cons: Battery dependent and not easily portable. In general a little too “high tech” for my personal taste, but we all warmed up to it as we played it more. How often daughter plays it: Quite a bit since we opened it. Do your kids play single player games? Which ones are their favorites? Follow the collaborative board Gift Guides for Kids on Pinterest. Jump out to the landing page of Gift Guides for kids by visiting Gift Guides for Kids landing page. What a great list! We love education, brain teaser type games. You included a few new ones I would like to checkout. Ooh, several new ones to me here that I think my kids would enjoy! I could see Johnny really enjoying Laser Maze. Great list! We have a LOT of single player games - I like to set out several at a time, so the kids can rotate through them. 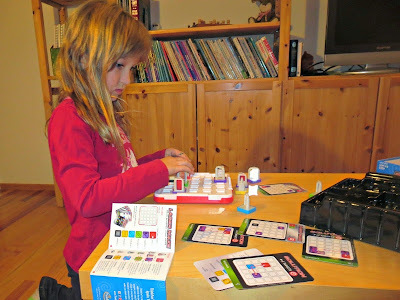 We like Thinkfun's Block by Block, Amaze, IZZI (my personal favorite) and Lonpos' Pyramid Challenge. We have Solitaire Chess too - but it's never really caught on. We have a few of these, not as many as you, but several of them. They get pulled out from time to time. I like them for car games and things like that.